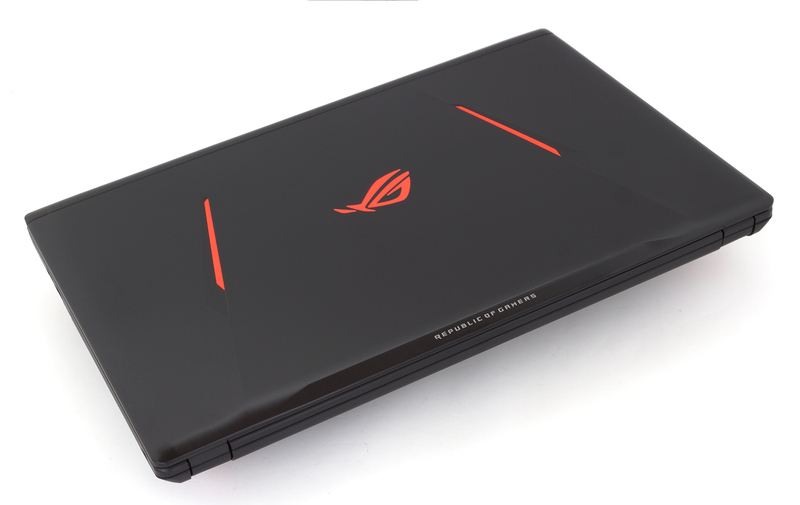 LaptopMedia.comReviewsASUS ROG Strix GL753VE review - what does the 17-inch version offer that the 15-inch doesn't? 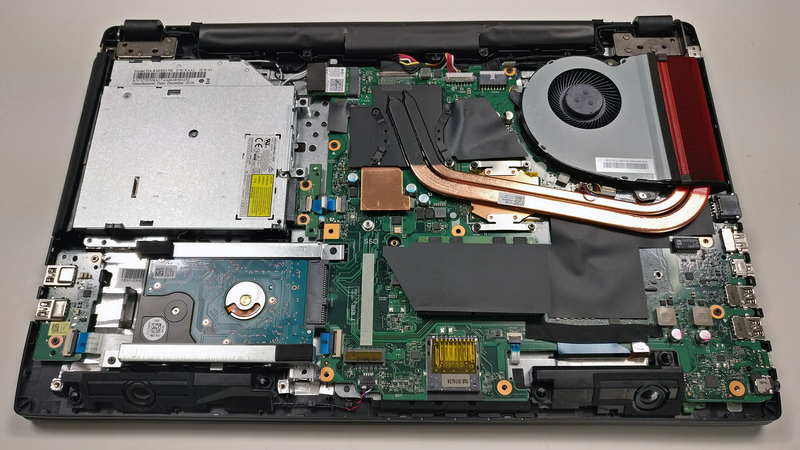 17-inch laptops have always been pricier than their 15-inch counterparts and often we don’t understand why. The bigger chassis doesn’t come with anything more compelling except the bigger screen diagonal. There are the same storage options, no bigger battery or even better cooling. 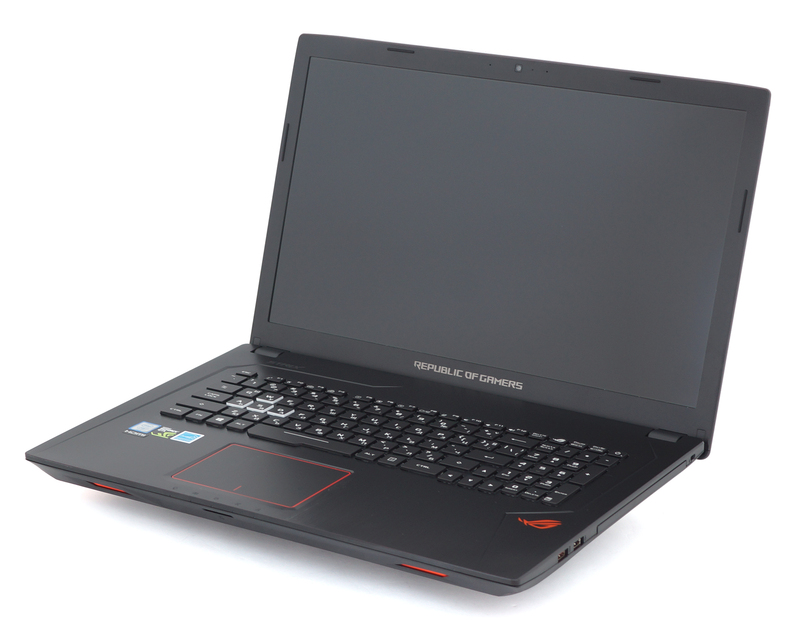 With the 17-inch GL753VE things are slightly different – the price of the laptop is negligibly close to the 15-inch model but only in some regions, like in the USA. In Europe, the price difference is more than €50 and we are still puzzled by why is that. As we said earlier, the GL753VE comes with identical specs – Intel Core i7-7700HQ, NVIDIA GeForce GTX 1050 Ti, at least 8GB of DDR4-2400 memory and the usual M.2 SSD + HDD storage configuration. 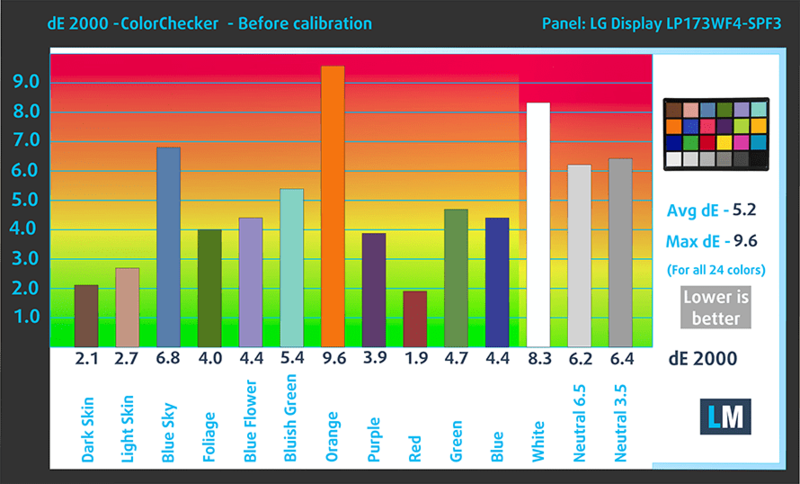 But despite all the similarities, we expect the GL753VE to perform differently in some tests. The battery life is expected to be lower (since the unit is the same but the screen is bigger and requires more power), the cooling performance might be better (due to the extra room in the larger chassis) and the IPS screen will most probably score differently in our tests. We hope that PWM won’t be an issue this time around. Let’s dig in. 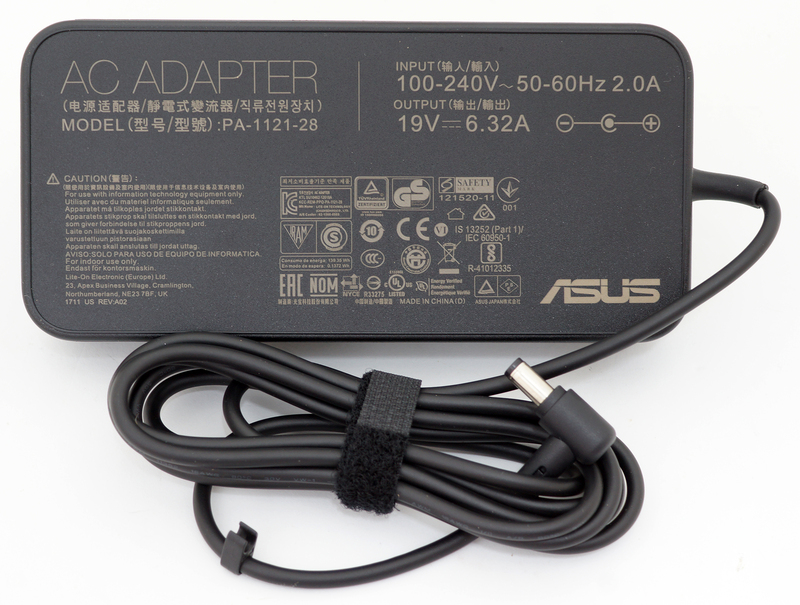 The retail box contains the usual user manuals, AC adapter, power cord and cleaning cloth. As expected, the GL753VE doesn’t differ from its 15-inch sibling in terms of design, build quality and overall appearance. Only the weight and dimensions set those two apart. While the GL553VE weighs 2.5 kg and measures 30 mm in thickness, the GL753VE goes up to a hefty 2.97 kg and measures 33 mm in height. To be fair, none of these two are actually portable so you really have to ask yourself if the larger screen is worth it. 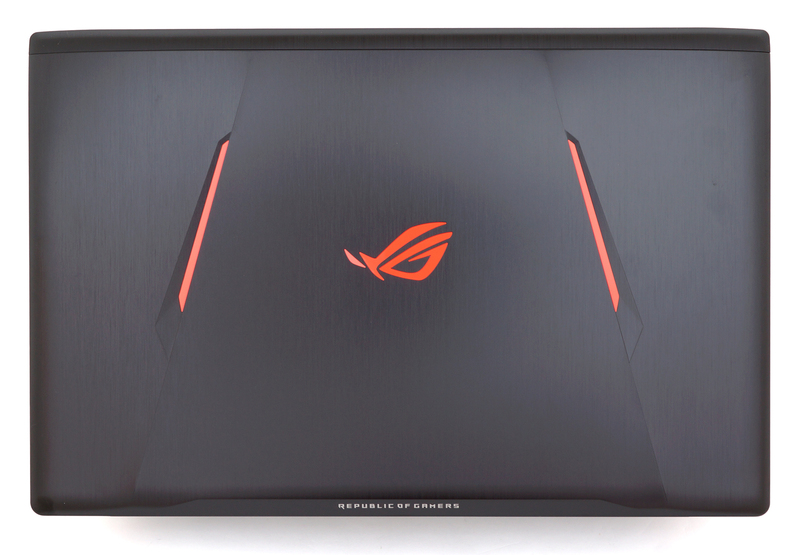 Anyway, the lid is again made of brushed aluminum with the illuminated ROG logo in the middle. The material isn’t very resistant to pressure and torsion but it’s not so bad compared to its competitors. 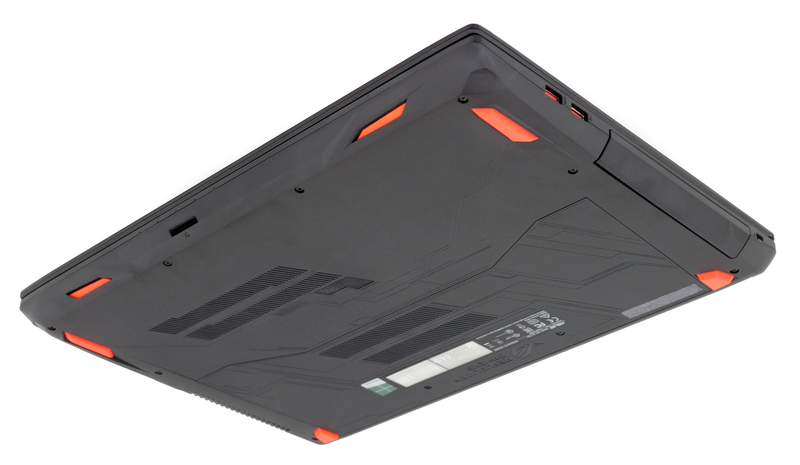 The screen hinges provide fairly smooth travel and allow the notebook to be opened with just one hand. They also keep the lid stable even when placed on uneven surface. 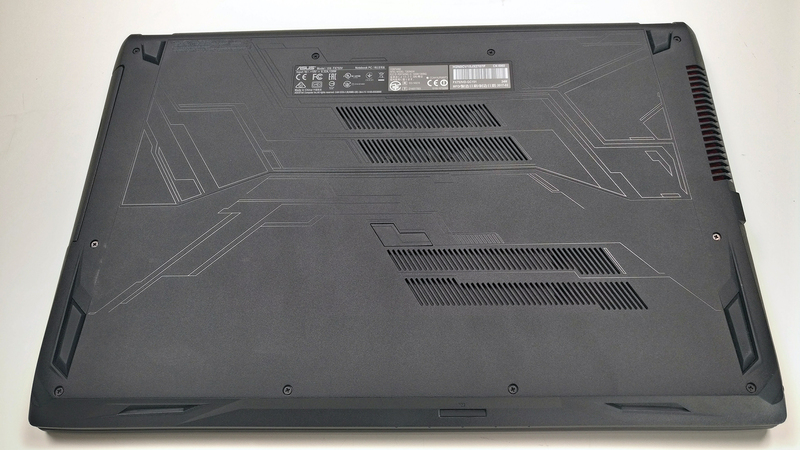 The bottom of the chassis uses a generic roughened black plastic with orange-colored rubber feet and a few grill openings for cool air intake. The sides come with the some added connectors to the standard set of I/O on the 15-inch model and this is great news because there’s another reason to opt for the bigger alteration. The left side has the usual grill for dispersing the heat, RJ-45 for LAN, HDMI, mini DisplayPort (kudos for that), two USB 3.0 connectors and a USB-C 3.1 (Gen 1). The right side accommodates the optical drive and two more USB 3.0 ports. The SD card reader is placed at the front with the two speakers on each side. Just like the whole base, the interior is also made of plastic but this one imitates brushed aluminum. Fingerprints stick easily, just like the real deal, but the rigidity isn’t the same. There are some weak points around the touchpad and the center of the keyboard but nothing too alarming. 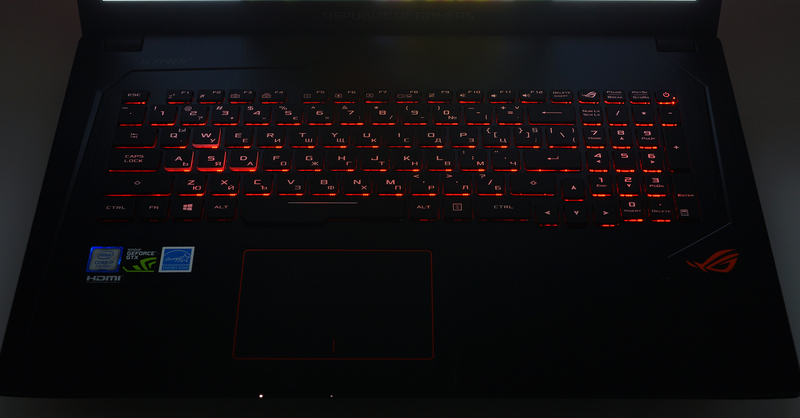 The keyboard is awesome as always – tactile clicky feedback, long key travel and RGB backlight. Unfortunately, though, the same cannot be said about the touchpad – not the most comfortable gliding surface, a bit small for a 17-incher, sluggish and clicks feel a bit too stiff to our taste. The overall build quality is decent and on par with most of the competition but the thing is that this laptop costs more than its rivals so we expect at least slightly better build quality. Aluminum can be found only on the lid, which isn’t very impressive in terms of rigidity as well. The base uses a bit flexible plastic but none of these issues should pose any problem during normal use. 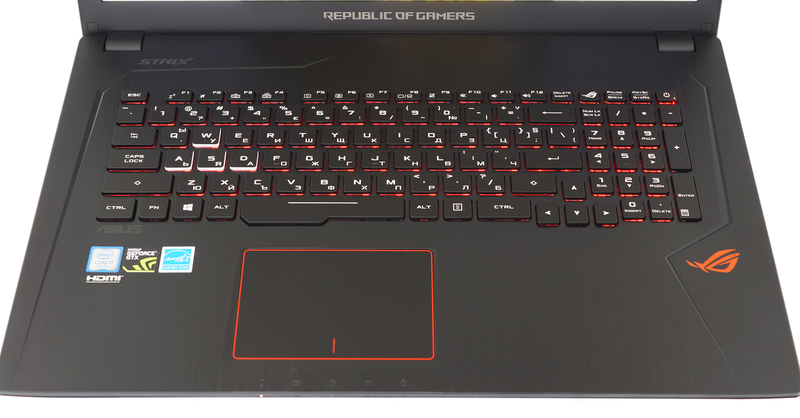 The touchpad is again subpar but the keyboard compensates with excellent feel during gaming and typing. Portability might be an issue for some users as well, although you can’t really expect miracles from a 17-inch gaming machine. There are no service covers around the bottom but it can be removed quite easily giving access to all of the internals for upgrade and maintenance. Just make sure you’ve removed all the screws around the bottom including the one hiding beneath the silicone cap in the middle. As we expected, the notebook comes with a standard 2.5-inch HDD on board and also a free – in our case – M.2 SSD slot supporting PCIe NVMe drives. 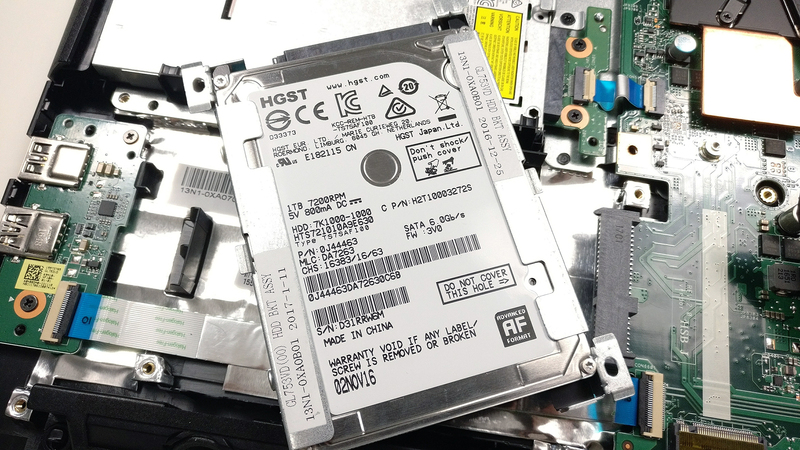 The 2.5-inch HDD is an HGST 1TB spinning at 7200 rpm. 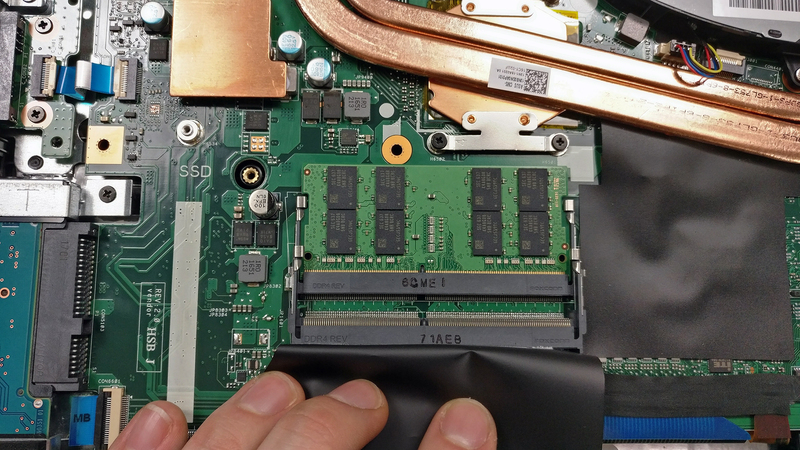 Right next to the HDD, you will find the M.2 SSD slot. But if that’s not enough, you can always replace the optical drive with a caddy with another 2.5-inch drive. Of course, the motherboard holds two RAM chip slots each supporting up to 16GB of DDR4-2400 memory. 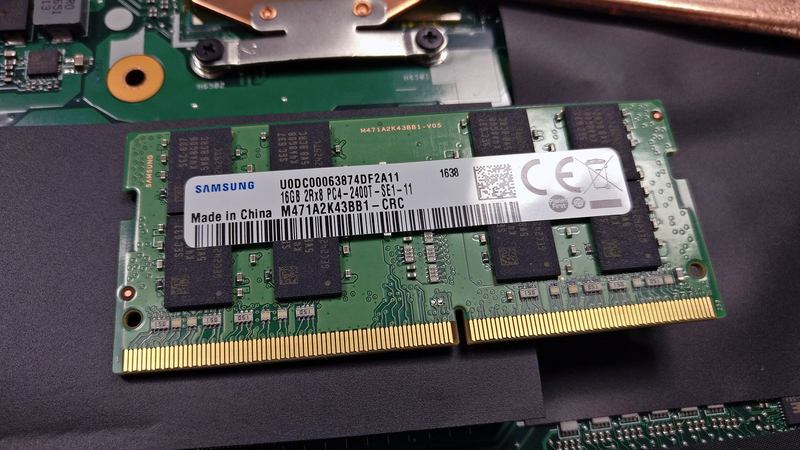 Our unit arrived with just one 8GB DDR4-2400 chip installed from Samsung. 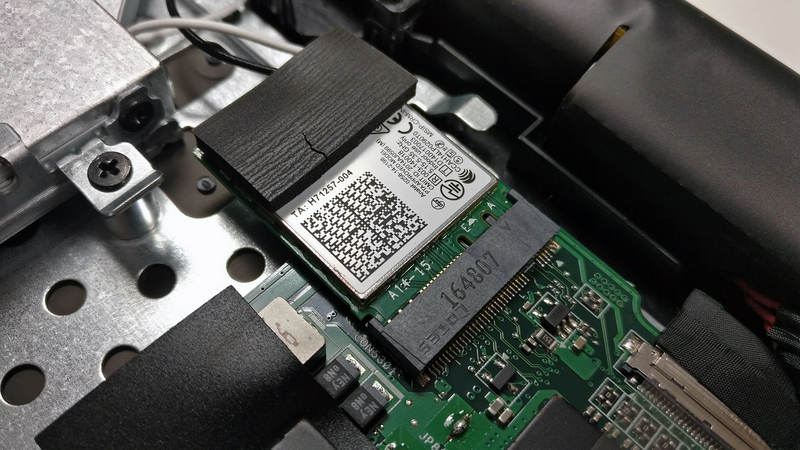 The Wi-Fi adapter is placed near the optical drive – Intel 7265NGW. 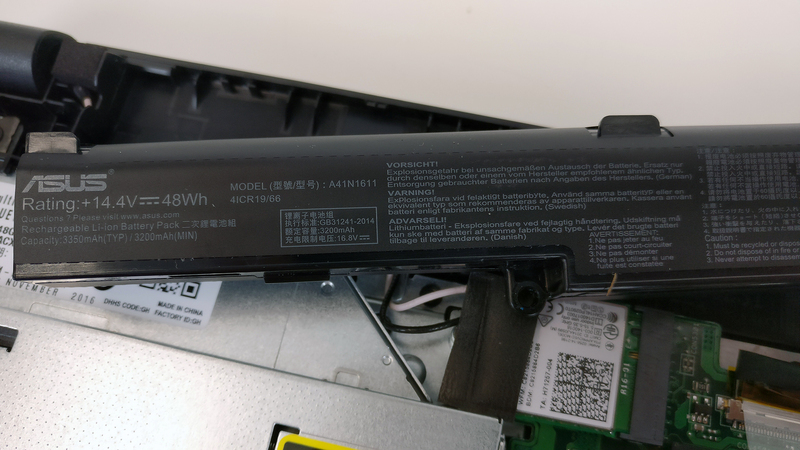 The battery is placed between the screen hinges and it’s rated at 48Wh. The cooling system hasn’t changed and still uses only one fan and two heat pipes going across the CPU and GPU heat sinks. 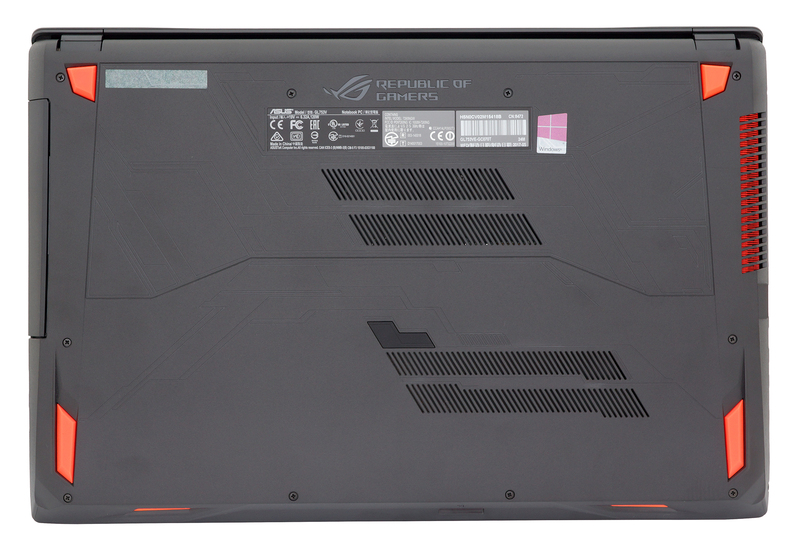 The ASUS ROG GL753VE uses the same IPS panel as the ASUS ROG Strix GL702VS – an LG-made LP173WF4-SPF3 display with Full HD (1920×1080) resolution. This means that the pixel density is 127 ppi while the pixel pitch is 0.1995 x 0.1995 mm. The screen can be considered as “Retina” when viewed from a distance equal or greater than 69 cm. The panel provides excellent viewing angles. We’ve measured a maximum brightness of 377 cd/m2 in the center and 355 cd/m2 as average across the surface with just 8% deviation. The color temperature at maximum brightness is 6630K, which is pretty close to the optimal 6500K. As we go along the grayscale, the average color temperature remains close to the optimal – 6670K. You can see how the results change at 140 cd/m2 (37% brightness). The maximum color deviation dE2000 at 140 cd/m2 is 2.6 in the upper right corner. This is a relatively good result since values above 4.0 are unwanted. 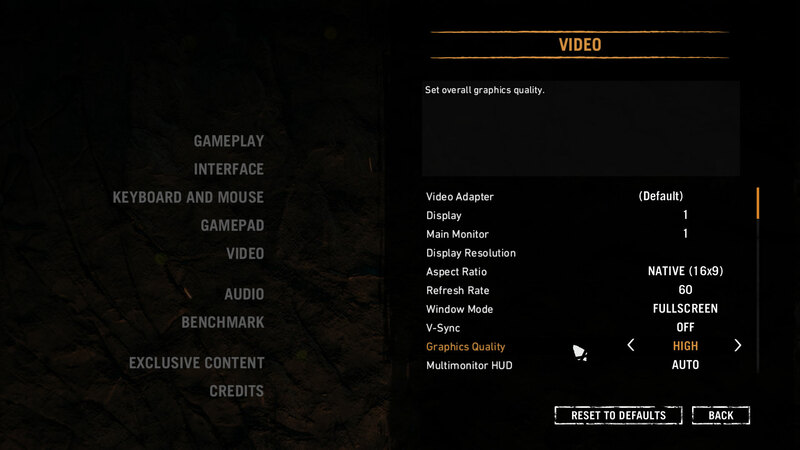 The contrast ratio is 1000:1 but goes down to 970:1 after calibration. 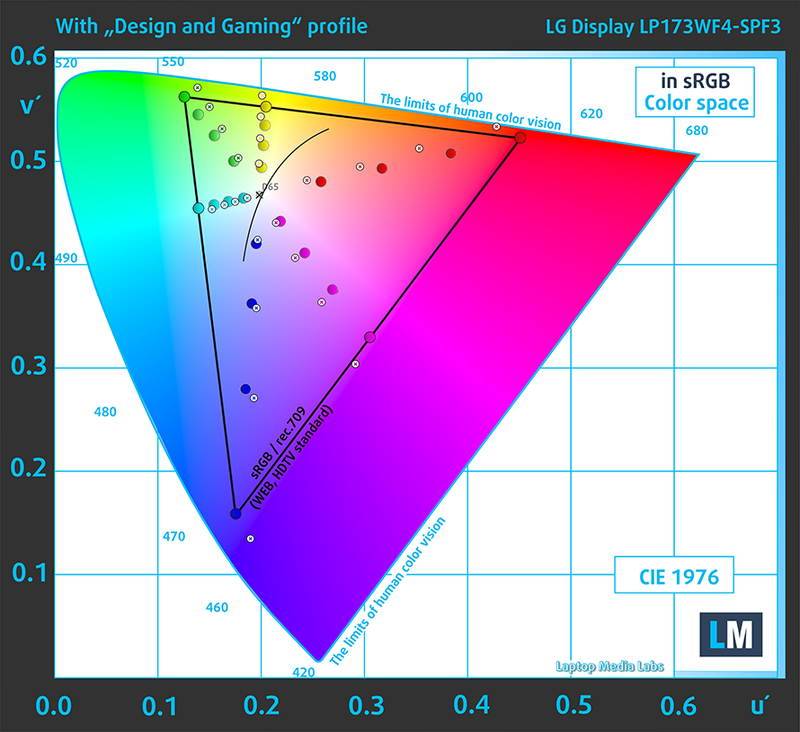 The display covers 88% of the sRGB color gamut making it perfect for multimedia and gaming. We recorded Fall Time + Rise Time = 19 ms. That’s a fairly fast response time for an IPS panel. The case with this notebook’s display regarding PWM is the same – PWM occurs only sometimes at extremely high frequency (120 kHz) so practically, the panel doesn’t use PWM from 0 to 100% brightness. The presented IPS panel here is of high quality and offers everything you’d need for a good gaming and multimedia experience – high maximum brightness, wide sRGB coverage, high contrast and no PWM across all brightness levels. The only things missing here are the high refresh rate and G-Sync but those are usually intrinsic to high-end gaming laptops so we can let that slide. We used the pre-installed Windows 10 Pro (64-bit) for the writing of this review but if you wish to perform a clean install of the OS without the bloatware, we suggest downloading all of the latest drivers from ASUS’ official support page. 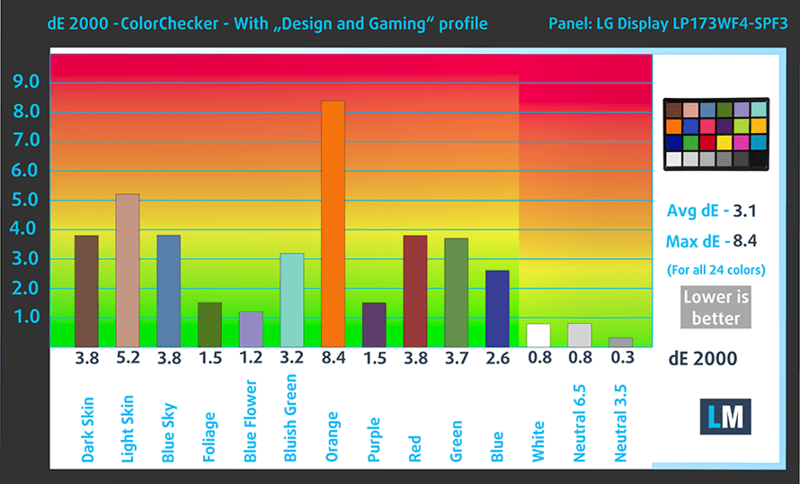 To be honest, we weren’t surprised by the poor battery performance considering the fact that the GL553VE is a 15-inch laptop with fairly small battery capacity and scored borderline satisfactory while the GL753VE has an identical battery unit that has to light up a considerably bigger IPS display. Our tests confirm that the 48Wh unit just isn’t enough to keep the lights on for longer than we would like. In fact, the endurance of the machine is subpar by any means. All tests were run with the usual settings – Wi-Fi turned on, screen brightness set to 120 cd/m2 and Windows power saving mode turned on. Unsatisfactory web browsing runtime – 260 minutes (4 hours and 20 minutes). Even lower score here and barely enough for a full movie – 145 minutes (2 hours and 25 minutes). It’s quite unlikely that you will start a gaming session without being close to a power source, but it’s good to know that you can play for more an hour – 73 minutes (1 hour and 13 minutes). Fritz is a chess benchmark that tests the computing capabilities of the CPU with various chess moves. The Intel Core i7-7700HQ managed to get 13.399 million moves per second. For comparison, one of the most powerful PCs, Deep(er) Blue, was able to squeeze out 200 million moves per second. In 1997 Deep(er) Blue even beat the famous Garry Kasparov with 3.5 to 2.5. 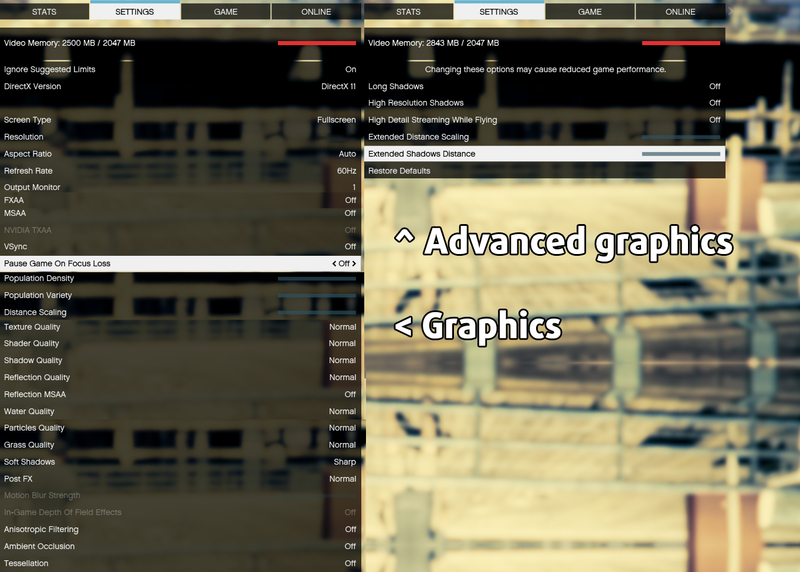 Here you can see an approximate comparison between the GPUs that can be found in the ASUS ROG GL753 models on the market. 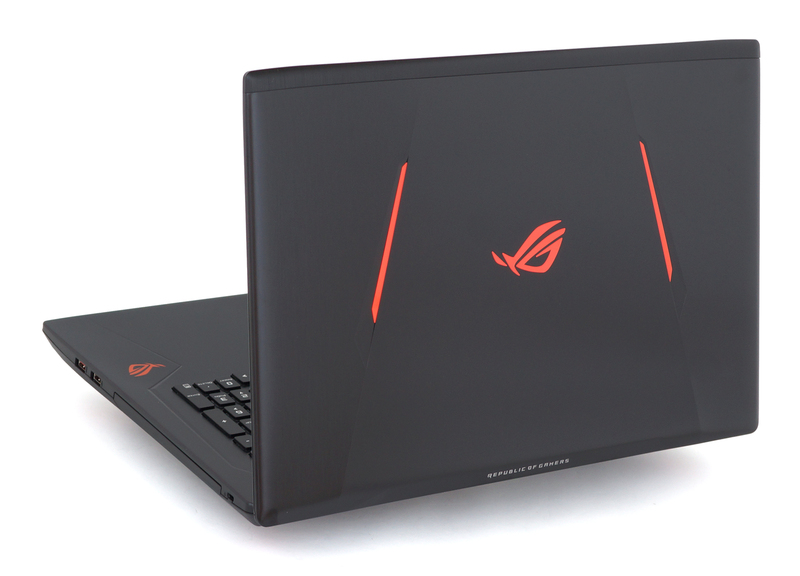 This way you can decide for yourself which ASUS ROG GL753 model is the best bang for your buck. Of course, the stress tests don’t really represent real-life usage or even gaming sessions but they get pretty close to the latter. The torture tests are still the best way to assess the overall stability of the cooling system and its longevity. We started with the CPU stress test for about an hour and we were pretty delighted by the relatively low temperatures that the system was able to provide for the chip. The Core i7-7700HQ was running rock-solid at 3.4 GHz and within the 75-85 °C range. However, we have noted that such big difference in temperatures between cores isn’t good – one of the cores reports 75 °C while the other 85 °C. This might be due to bad thermal paste or heat sink design. 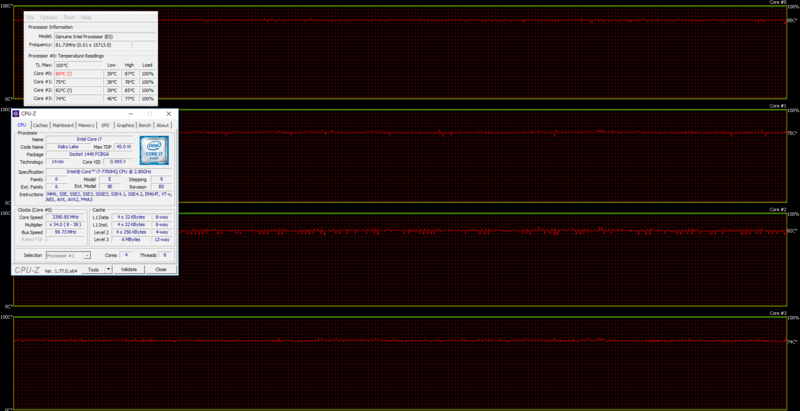 When we ran the GPU stress test, things didn’t change much for the CPU but the GPU didn’t reach its maximum potential. 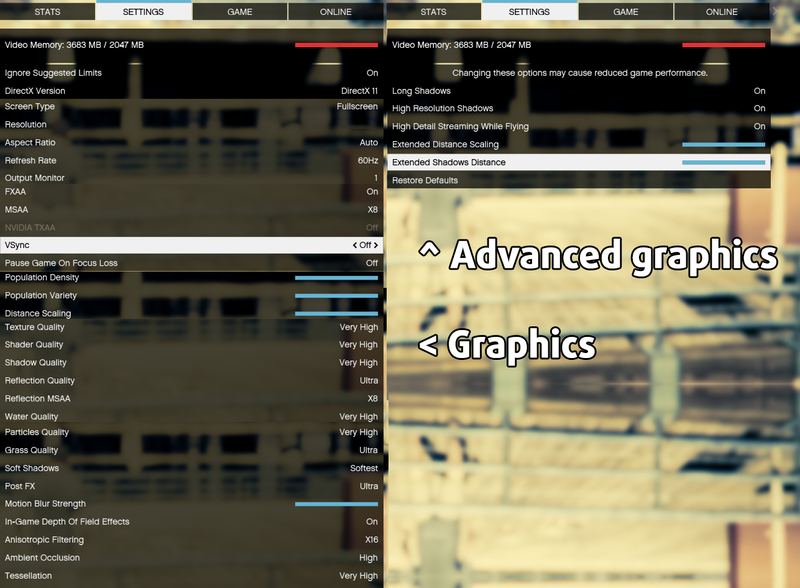 While the GL553VE prioritized GPU performance over CPU clock speeds, the GL753VE did exactly the opposite. In our stress test, the GL553VE utilized the full performance of the GTX 1050 Ti while keeping the CPU lower than its base frequency. The GL753VE, on the other hand, kept the CPU at its base frequency and didn’t push the GPU beyond 835 MHz which is almost half its usual clock speeds. 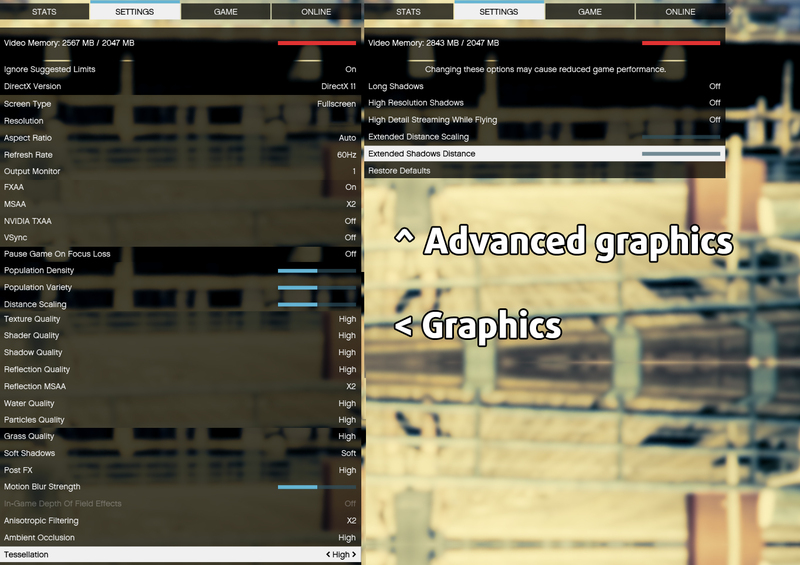 Interestingly, the GTX 1050 Ti’s temperature was exceptionally low at 68 °C so it’s clear that the GPU can go much faster. We are not sure what’s the culprit of the problem here but a future BIOS update might sort this out. It might also be an isolated problem with the unit we got. 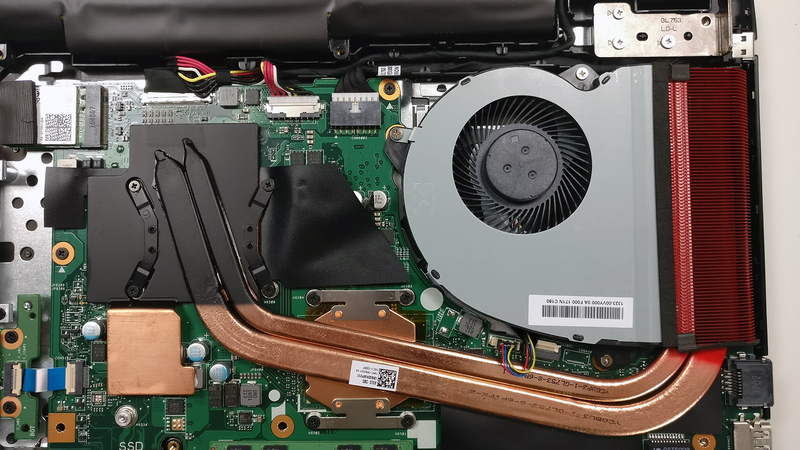 Even though the system uses a single fan design, which is insufficient for such powerful hardware, the surface temperatures were even lower than on the 15-inch model. Quite impressive if you ask us. Our opinion on the 17-inch variant doesn’t deviate too much from our initial thoughts on the GL553VE – generally solid all-rounder, which is slightly more expensive than the competition but at least you know what you are getting here. But most of the complaints from the 15-incher remain – questionable build quality, wobbly touchpad, a bit hefty construction and a cooling system that needs improvement (higher inner temperatures). However, the keyboard is excellent not only for typing but for gaming as well. We also liked the expanded I/O – more connectivity than the 15-inch GL553VE and retains the good picture quality thanks to the excellent IPS panel. We would have appreciated a bigger battery because the 17-inch screen draws considerably more power resulting in less than stellar battery performance. Are there any other budget/medium laptops with a relatively good screen and GPU you would recommend? I am looking for a desktop replacement that could run less demanding games (X-Com 2, strategy games) and could be a 2nd screen for photo editing (when a standalone display is not available). It seems it’s this (I know gtx 1050 Ti may be an overkill) or Dell XPS 15, which offers better screen for higher price and weaker GPU – a weaker GPU is OK, but the price difference is quite big.